How to Get (Back) into Meditation—10 Tricks of the Trade. I’ve been practicing and teaching yoga and mindfulness for 12 years. I’m neither a guru nor an expert and I’ve gone through many phases of practicing regularly and not practicing regularly. I am currently, for example, out of habit. I could list excuses or reasons but I won’t bore you with the details. Point is, I’m starting fresh. And so, as I begin again these are five techniques I find helpful in my own meditation practice along with five wisdom quotes from great spiritual teachers. May they be of benefit! First closed eyes, later opened eyes. Meditation is simple but it can also be overwhelming, in that there are so many teachings out there, so many different techniques. I am in favor of sampling and trying out different practices at different times throughout life. In my experience, keeping the eyes closed during meditation practice helps us turn our attention inward and block out visual distractions. Keeping my eyes closed helps me attain a meditative state more easily. But, I also like to practice meditation with open eyes as they teach in the Zen tradition. I’d suggest practicing for about 10 minutes with closed eyes then another five or 10 with the eyes open. “Your true home is in the here and the now. It is not limited by time, space, nationality or race. Your true home is not an abstract idea. It is something you can touch and live in every moment. First long, deep, conscious breathing, later natural and relaxed breathing. Likewise, practicing deep breathing is a great way to focus the mind and relax the body. Count, say, 15 breaths at the beginning of your meditation session. (Less or more—find what works best for you). Then let go of the counting. Just sit with no technique for a moment. Let the breath be natural and relaxed. Finally, launch into your chosen technique of meditation for another period of time. A formal sitting practice is key to establishing a meditation habit and cultivating a meditative, open, productive mind. Standing meditation is another way of practicing in stillness. As we progress in our practice and discipline we can also experiment with walking, eating and working meditation, among others. Then again, if you just cannot sit still try the converse of this technique—first move, later sit. Do hatha yoga. Stretch and move your body to prepare it to be able to sit in sustained meditation. First observe awareness and physical sensation, later work with thought and emotion. The most basic, simple techniques of meditation involve bringing our attention to the moment through noticing bodily sensations. Visualization and mantra are other techniques that help us develop greater concentration. We might try opening a 20-minute meditation session with five minutes of repeating a sacred mantra or affirmation before practicing 15 minutes of insight meditation focused more on working with emotions and thoughts. “The mind is very wild. The human experience is full of unpredictability and paradox, joys and sorrows, successes and failures. We can’t escape any of these experiences in the vast terrain of our existence. It is part of what makes life grand—and it is also why our minds take us on such a crazy ride. First notice everything with curiosity, later drop judgment. The real trick of meditation is of course, to actually do it, ideally with regularity and at length. To do so, we must realize that everything is okay. Whatever we feel, however good or bad or amazing or ugly is okay. Whatever we think is okay. It’s just our mind doing it’s thing. Everything changes constantly. All we have control over is our own reaction to the causes and conditions we face. So as you first develop a sitting practice be open and curious. Watch the mind. Learn its tricks. Know thyself. 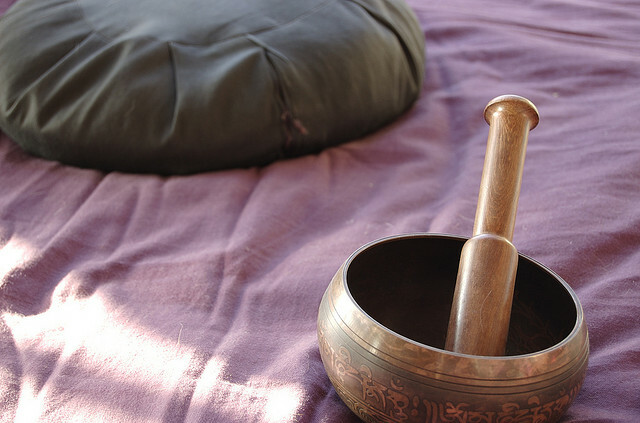 As the practice deepens we can work with more advanced techniques like metta, tonglen or zazen. We naturally begin the process of letting go of fear, judgment, blame and anger. By practicing meditation we realize the nature of impermanence and the way our thoughts and feelings change from moment to moment. We learn how to relax into the present and are then more able to relax—and think strategically, creatively and critically—on cue. Don’t claim not to have time for meditation. Please. You are on the internet. You have time for meditation. Start small and slowly, gradually build endurance. After a little consistent practice the habit becomes stronger as we start to feel the benefits. Meditation—let’s get (back) to it! I've been sitting with my wife as cancer takes her, I've gained weight and haven't sat or done yoga for so long, all the while promising myself this will be my first priority…in the future. Every time someone asks me, "How are YOU doing",or, "Remember to take care of yourself", I always know I should just get back on the cushion for a few minutes to start and maybe just some Cat/Cows in the morning for starters. Thanks for the gentle reminder and an article with a refreshing (non-sexual overtones) subject matter. I feel Elephant has gotten a bit long in the tooth on those topics. Thank you for your insightful words. I, too, am trying to get back to a meditation practice and these reminders are perfect.